Along with rumors that it’ll rival the iPhone come others that say it has its own iPhone-like antenna issues. Reuters is reporting a group of cell phone industry analysts are strongly hinting the Bold 9800 will launch at the upcoming RIM press event next Tuesday August 3rd in the morning, Eastern Standard Time. According to these informed folk, the timing is critical, and the sooner “they are going to say it is going to be available, the better,” as the market appears primed for excellent sales. It’s no coincidence that Apple’s iPhone 4 launched just a few weeks ago, either. What do we know about the 9800? It’s the first device that’ll be running RIM’s new flavor of OS, BlackBerry 6 (bringing a faster webkit browser and new, sleeker look and feel to the UI, which has been looking clunky and old-fashioned compared to its Apple and Android rivals), and it will be similar to some previous incarnations of the BlackBerry, with a large touchscreen that slides vertically to reveal a physical keypad. Amusingly enough, given the fact that a big-shot news agency like Reuters is calling it a serious rival to the iPhone, there’s some discussion online that a leaked demonstration video of the 9800 reveals that it may suffer from a similar “death grip” antenna effect like that reported to affect the iPhone 4. Will Apple be nervous? Probably not. The iPhone has revolutionized the smartphone market, and the newest unit has been selling like hotcakes, despite the press furor around the phone’s potential antenna performance issues. 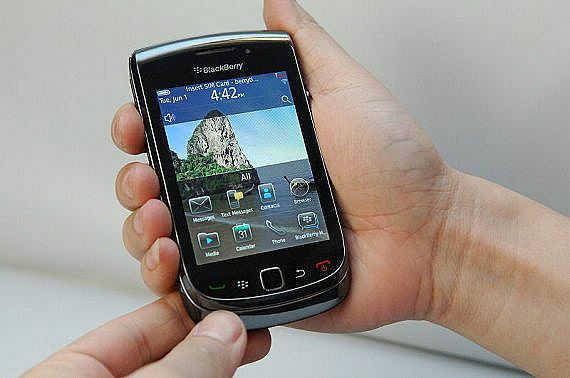 It’s also been grabbing increasing numbers of business users (and even more so with the iPad), which is RIM’s traditional stomping-ground–to such an extent that RIM’s even been forced to appeal more and more to the consumer market. The 9800 is not an “iPhone killer,” sorry Reuters. Still, the market price of RIM’s shares bumped up slightly today on the news, and the phone will certainly find good sales among BlackBerry enthusiasts, and consumers who are shy of Apple–assuming the 9800 hits the shelves at the right price (though its leaked off-contract retail price of $700 isn’t very promising in this regard). The phone will debut on AT&T before hitting Canada and Europe later in the year.